Slowly getting it dialed in. Man, that sounds like four angry squirrels on steroids, and smooth as silk. You need to invest in a dyno run to see the numbers. Definitely sounds like it's ready. It's running pretty good,i swapped the 19lb injectors for some 24s so AFRs seem to be happy under boost now. I tried some 30s but they were too much at idle,the 24s seem to be as big as the stock ECM can handle. I'm curious to see what it can do on a dyno too. It's the original 89 Renix block and head but it's dressed as a 2.5l MPI. It's a mixture of 91 MJ and 95 YJ. 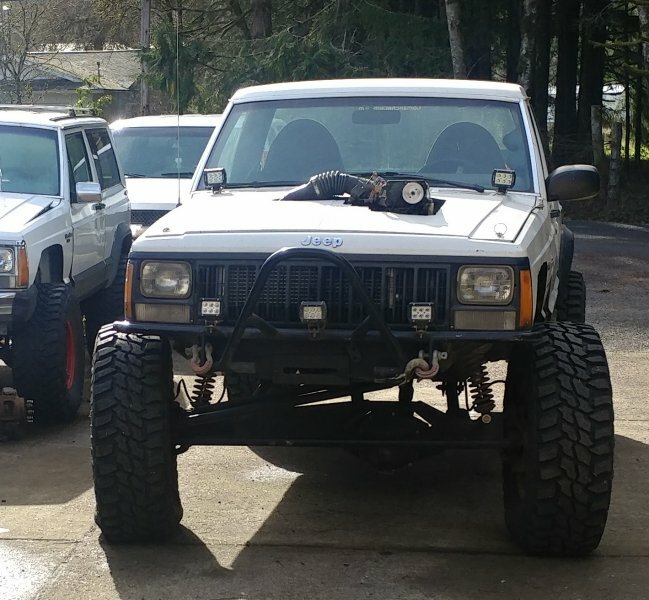 Your dedication to the little 2.5L is admirable mnkyboy :thumbsup: I'm not typically a 4-banger kind of guy but even I have to admit that thing sounds mean as hell and it sure looks like it goes like hell too. I'd love to see what kind of numbers you're getting out of it. Another short video the wife got of the MJ. I took the MJ to a clean up a couple weeks ago,we removed 3,360lbs of trash from a local OHV area. Afterwards i got to play on the trails a little. Here's a video someone put together,towards the end is some footage of the MJ in action. I decided to finally install the RCVs that have been sitting in the garage for the last few months. A link to my YouTube channel,it's got a bunch of footage of the MJ. Took the MJ to NAXJA's NWfest,didn't get much for pics but other than a few minor issues the truck did great. How do you like the RCVs? So far i like them,I haven't been able to break them yet. They felt pretty smooth the little bit that I've driven on them with the hubs locked in. Picked these up from the shop yesterday. Hey Mnkyboy, what shop did you get your lovely driveshafts made at? Six States on Columbia Blvd. Thank you Mnkyboy, I was kinda figuring that would be the best spot to go for a new(custom) drive line. Especially at the price you had paid for both, I would probably pay for one. Haven't posted in a while, i messed up my knee so i haven't done much with the MJ lately. I have been gathering some parts, i have parts to build a sector shaft support for the steering box, a new header to replace the one that cracked,a new larger PS cooler, an adjustible FMU, and a much smaller pulley for the supercharger so it will be getting a big increase in boost. Hopefully i can get on these projects here soon. Love those coils. They look awesome crossed up! What kind and size are they? I have some supercharger questions. How did you plumb the air/water cooler and radiator? Where did you get the one you show? What did you use for a pump? How did you hook up the oil supply and return? What boost are you running? Are you retarding timing under boost? No additional fuel? The water/air system has a 4 gal icebox/reservoir in the bed, a 12v pump moves the water through copper pipes under the truck to further dissipate heat before it goes through a bar & plate style heat exchanger in the grill then through the Laminova intercooler. The pump is a clone of a Bosch style 12v pump for a water air set up that's used on a few OEM systems. I bought the supercharger and intercooler used and adapted them to my engine, Avenger superchargers use to sell the same set up in their TJ kit but it's not available anymore. The supercharger gets oiled like a turbo, it has a feed line coming off the oil pressure sending unit and a drain to the oil pan, it also could have been set up self contained like many OEM superchargers. In all the videos you saw on You Tube the boost was at 3psi, i have a pulley to bump it to around 10psi but I haven't put it on yet. Currently it has MPFI with 24lb injectors and a MAP adjuster, i also have an adjustable FMU but i haven't got it set up yet. I monitor AFR with a wideband and so far it's happy at low boost.